Now I did an awful lot of illustrating in 2015 including two short storybooks and over thirty-one ink drawings for the Inktober challenge – wow! However, this post isn’t about any of those drawings. Nope these are the other seven illustrations I created in 2015, which included three commissions. I really was having a lucky year for commissions! I’ll start off with the largest of the set that wasn’t a commission. 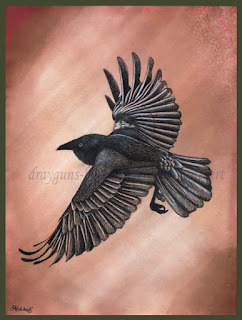 The below raven was a self-set challenge to draw an entirely black bird with its wings in perspective. I’ll admit I struggled with placing the initial sketch and it took some time to get my head around the skewed proportions. All in all, I think I was happy with the outcome. That said if I were to try a similar feat again I think I will incorporate more colours to blend a black rather than sticking to the true black pencils and pens I have in my sets. Waterman ink wash, Micron ink, Prismacolour pencils and Sakura white gel pen on Bristol vellum card. Speaking of black and white subjects the below rose was a nice little book cover commission for a novel titled Dark Moments written by Emma Brown and published by Darcy Nybo. Obviously the version I am showing here is the one without the typography added. 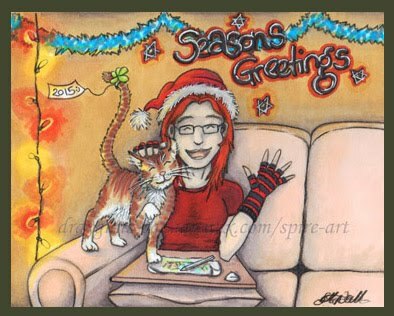 Watercolour markers and Prismacolour pencils on Bristol vellum card. Pure black background added digitally. 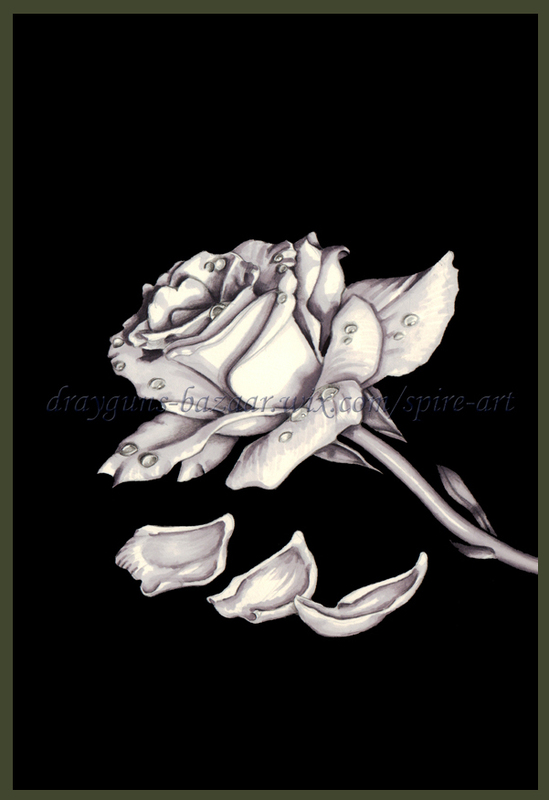 The author was very clear about wanting a white rose with water droplets on a pure black background. I worked from a reference photo to create the sketch and shaded it using watercolour markers. Since the markers could never create a pure black background and the version sold was to be a digital copy, I then took the image into Photoshop to create the solid backdrop as required. I am not a great fan of drawing realistic flowers and don’t consider the subject one of my fortes, especially not roses! Therefore, I was pleasantly surprised at how well the end result turned out. Now this below commission is one that I found very difficult to complete. 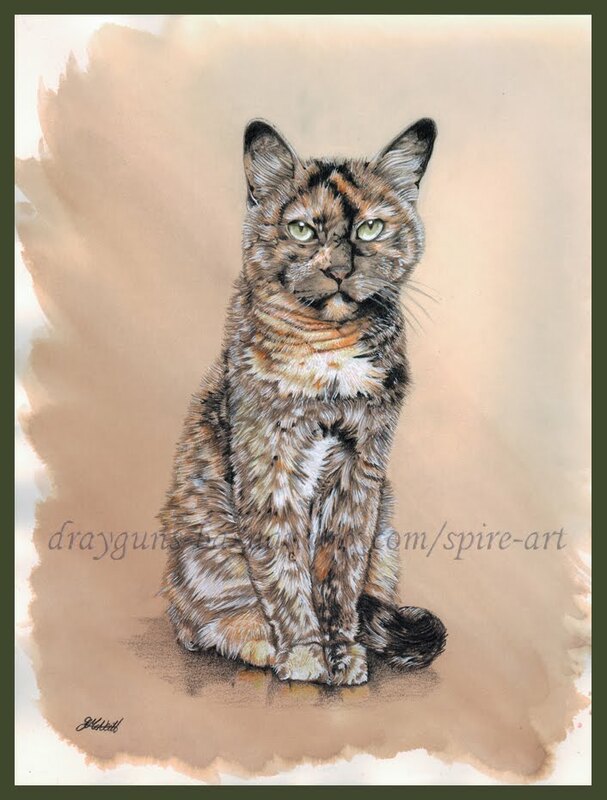 It came about because a couple saw my previous illustration of Cat in a Sunbeam hanging in the local gallery. They asked if it would be possible for me to create a similar portrait of their daughter’s cat Chloe. Well of course I just couldn’t say no! Thankfully I had some paper with a similar ink wash. (That ink is one I just cannot find a good replacement for so I guess I won’t be making many more with that wonderful shade of brown for a backdrop.) I had quite a long time to complete the piece but decided to work on it solidly every day for a week and build it up section at a time. Trust me, mottled fur that goes in several directions is a good way to go cross-eyed and lose your place in a drawing! Still it was an excellent challenge since cats are a favourite subject of mine and I knew this was going to be a birthday gift for the owner. Next up the below illustration is an unusual commission that I rather revered. On an entirely different note … the below is a requested image from my beloved husband. 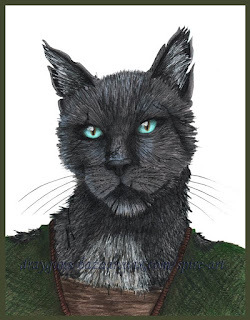 He had been asking for the longest time if I would make a portrait of one of his feline characters so I decided I would surprise him with a full illustration just like those I had previously made for my sister blog of Black Wednesday Isle. Well you knew there had to be at least one story related sketch in here! Watercolour markers and Prismacolour pencils on cartridge paper. This fellow’s name is Eyl’Yti (pronounced eye-lit-eye). I didn’t go so far as to make a fictional interview with him since I am no longer making portraits for the other blog but my hubby was happy with my rendition of his character none-the-less. This next one below is one of those little scrat sketches that I thought was really interesting and I’m certain no else did! 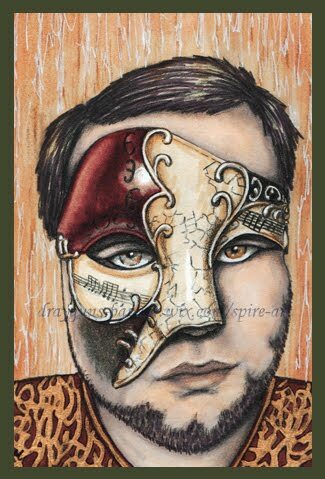 Parker, Indian and Micron ink plus gold acrylic paint on Bristol vellum card. Beginning as a leftover sheet from the Inktober challenge I got really into the idea of time as a concept. The little figurines being examples of how we perceive, use or misuse our time. I like questioning if we are reaching, escaping, waiting, holding on to, letting go of or simply just watching our time pass us by. Yeah I can see why this concept was a weird one lol. 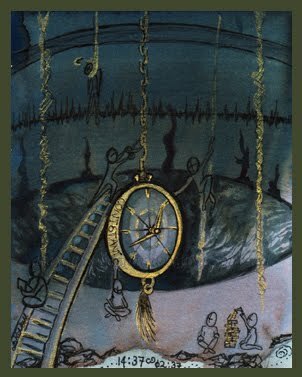 I still really like it as a personal piece but that might be because I love pocket watches more than anything else! Now I know it isn’t xmas right now at the time of posting but since this was one of the last illustrations I created in 2015 it made sense to end this blog post with it.